The Tech Sergeant (who is about to get a promotion and will have to be renamed) and I met in Milwaukee for a weekend of relaxation and exploration. We both ducked out of our respective homes late Thursday, I driving east and he west. I had to beat him there as I was the one with the hotel reservation. I’d used Hotwire and we were staying at the Hilton City Center. We both chose to park at the hotel, coworkers had shared a couple of “scary parking stories” and we knew we’d have to pull the cars at least twice. In true “watch us wilt at the same time,” despite plans of immediately launching ourselves on the town, we both opted for beverages and catching up and a midnight bedtime. Painting Milwaukee red would have to wait. We enjoyed the art museum and in grabbing beverages after TS discovered a lemonade that he would continue to drink all weekend, apparently it’s locally made and tart enough to make his eyes water. I forwent the joy of my eyes watering too. We ventured to the war memorial, which was a little underwhelming, though we did like all of the historical war ads (Men! Join the clean plate club with your wives!). From the museums we walked to the Historical Third Ward and did some shopping. He found an artist whose things he might purchase in the future and we “designed” two bathrooms and three kitchens. I like stainless steel accents, he prefers a warmer cozier look. Both of us like the idea of hidden fridges/dishwashers. 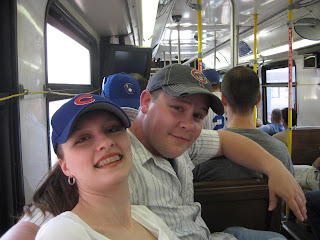 Then it was back to the hotel for a hat (coworker loaned me a Cubs cap for the trip) and to the shuttle. Out to the field and, loaded with beverages and hot dogs (later nachos) we took in the Cubs/Brewers game. Lots of fun with enthusiastic but not aggressive fans. A number of college student celebrating the end of finals. I did briefly wish I had some knitting with me but survived not having it. Despite the Cubbie loss we were able to go out and enjoy a couple of area bars. Apparently neither of us were going to be able to sleep late on this mini-vacation, we were up and out early every day. First we took my car and headed north. I made him navigate to two yarn stores. He patiently accompanied me and we discussed the use of mohair as a fly-fishing tool, found some corn yarn that was pretty awesome, and debated different types of tools that I use for my craft. We also found a good bagel shop and I broke the “braces no bagels” rule. I’ve been good about following that directive but fresh bagels were not to be missed. Then we got sort of turned around but managed to find our way to the Miller Brewing Company. We toured the factory, seeing just how many cases of beer they ship out each day. It was daunting to think of how much was shipped and consumed regularly from just that one location. Even more surprising: 40% of the products created there go directly and only to Chicago. I liked whatever they served us that had orange and coriander. Yes, I drink girly drinks. We finished the day with dinner at Cafe La Scala. The food was excellent. And….we both overate on appetizers and salad and couldn’t make it through our meals. Back to the hotel and the TS asked me to show him how to knit. We had a couple of hours lag time so I walked him through the basics. Unfortunately I only had one set of needles with me, so we had to go back and forth but he picked up on it pretty fast. I agreed to learn fly-tying next time. And then we took his car out late to see the new Star Trek movie. Being as I was without computer, I’d called the Milwaukee Public Library for help on who was showing it where. 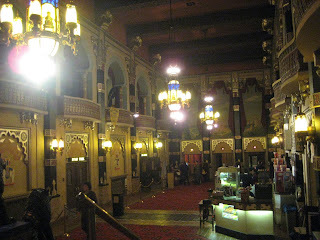 We ended up at the Oriental Theater. Wow–what a theater!! 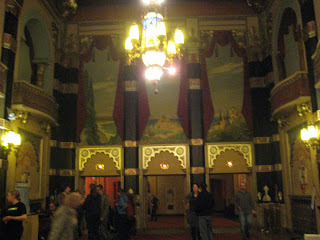 (sorry the pics are blurry, they said pictures were okay if I didn’t use the flash) Huge, “theater” style rather than what I would think of movie style seating, red velvet curtain, 7′ Buddhas, elephants…. Oh, and the movie was pretty awesome too! If you like Star Trek at all, I’d recommend that you go see it. It pays tribute without being super cheesy or trying to be too much it’s own thing. And the cameo appearance elicited a couple of cheers. Coming out of the theater we ran into people coming in for Rocky Horror, which was apparently being shown around 12 a.m. I could not convince the TS that we needed to stay for a late night double feature picture show, to have a toast, or do the time warp. Sunday was breakfast and back to the Third Ward to hit the Public Market. I’d already loaded up on goodies from a local chocolatier but cheese and curds going home with the TS had to wait until we were ready to go. (No fridge in the hotel room). After Starbucks and watching many little ducklings swim around the river, we got on the road. I made it home and promptly took a nap. Apparently he went by a Bass Pro shop on the way home.